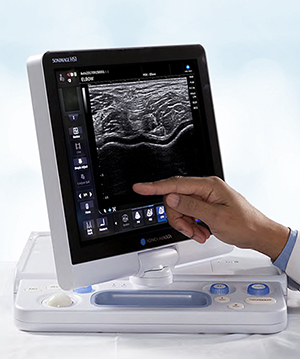 A new software upgrade that delivers workflow improvements, new imaging capabilities and artificial intelligence(AI)-assisted functionality that enables hands-free operation during interventional procedures is now available for the for the SONIMAGE® HS1 Ultrasound System from Konica Minolta. The system is designed for musculoskeletal applications, according to the Wayne, NJ-headquartered company. SONIMAGE HS1 now provides a clinician with simplified one-button image optimization. By using the UltraAdjustTM one-touch image optimization feature, multiple imaging parameters, such as frequency, focus and compounding, can be changed automatically by simply adjusting the depth. The result of these customized settings is excellent image quality and resolution reliably and repeatedly, enabling physicians to make a confident diagnosis, to provide therapeutic needle guidance and to monitor rehabilitation. This feature can also be activated with the new voice control operation. A new panoramic view option delivers both qualitative and quantitative imaging information by enabling the user to stitch together a series of images for a broader view of the patient’s anatomy. By using panoramic view, clinicians can assess large-sized lesions, display an entire abnormality, construct a cross-section image of a structure, and examine the relationship of two structures in a single image. Panoramic imaging technology widens the field of view for precise clinical diagnosis, measurement, and interventions. SONIMAGE HS1uses artificial intelligence(AI)-assisted voice controls for hands-free operation. With this ability to control system functions through simple voice commands, clinicians can hold the transducer in one hand and a needle or syringe in the other hand, eliminating the need for an assistant and maintaining the sterile field during procedures. The AI-assisted voice recognition technology uses machine learning to analyze data from actual interactions and improve performance and accuracy. The voice control operation also fosters user comfort and proper operator ergonomics while enabling the clinician to focus more on the patient and procedure. New software for Konica Minolta SONIMAGE HS1 ultrasound system. Appl Radiol.